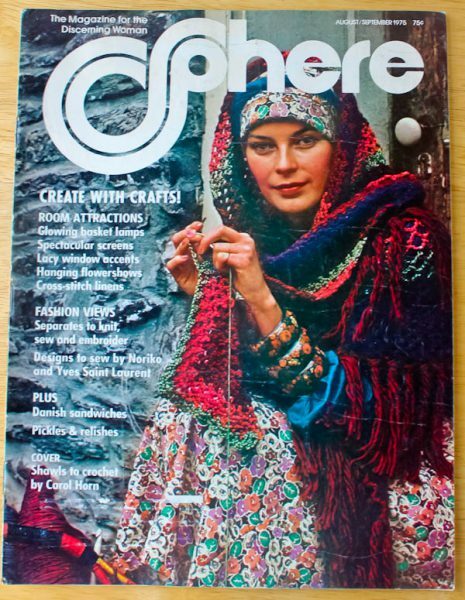 The flood of The Culinary Cellar in July destroyed all my vintage Sphere magazines, but I happened to have a couple of them upstairs by my desk ready to write for the next issues. This recipe for Eggplant Provencal is from the August/September 1975 issue. I think it was meant to feature vegetables available from gardens and Farmer’s Markets. But since they are all staples in most grocery stores year-round, I thought it also could be featured now as a nice vegetarian meal served with a warm baguette for Meatless Monday, or even as a side dish for Thanksgiving. 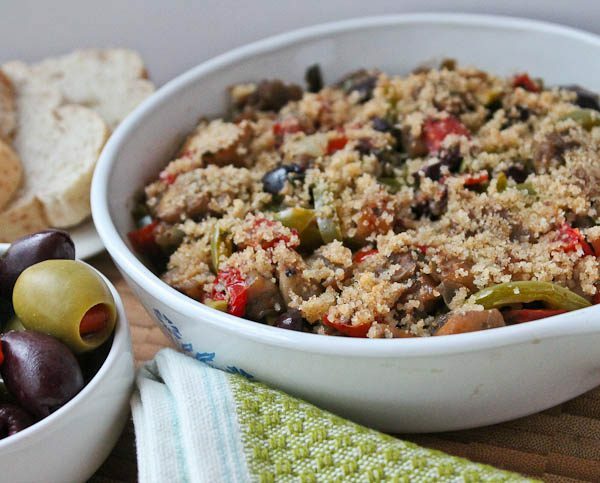 The dish features eggplant, green bell peppers, tomatoes, onion, garlic, parsley, two kinds of olives, capers, herbs, and a topping of bread crumbs, butter, and Parmesan cheese. Yummy! This recipe is in an article with all eggplant recipes. 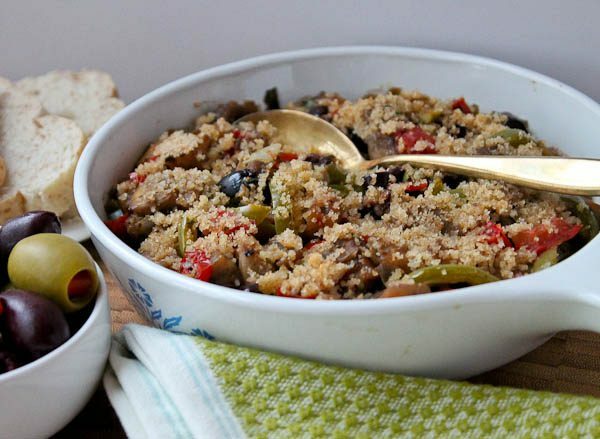 In addition to the Eggplant Provencal, some others include an Eggplant Ragout, Eggplant Parmesan, Chinese-Stuffed Eggplant Hors d’Oeuvres, Eggplant and Tomato Casserole, ones stuffed with oysters, meat-stuffed, and some with sauces like mint. There are enough ideas for at least a month! Other articles featured pickle recipes, how to make beautiful open-faced sandwiches, more than the usual craft and sewing projects, and one very special recipe for the “Blackhawk Salad” from the famous Blackhawk Restaurant in Chicago. Sphere editors claimed it took their special powers for owner Don Roth to reveal his original recipe served exclusively in his Chicago eateries. He called it his spinning salad with secret ingredients, but the secret is out that the exceptional flavor was from the blending of zesty seasonings with a creamy blue cheese mixture. It’s a really long recipe (took up half a page!). Now I am caught up with the Sphere monthly blogs and will have November 1975 issue and recipe up soon. Heat oven to 350 degrees. Have a shallow baking dish ready. Cook and stir onion and garlic in olive oil in Dutch oven over medium heat until tender, about 5 minutes. Stir in eggplant and green peppers; cover. Cook, stirring occasionally, for 10 minutes. Stir tomatoes, parsley, olives, capers, salt, pepper, basil, and oregano into eggplant mixture. Spoon mixture into ungreased baking dish. Mix bread crumbs, butter, and cheese. Sprinkle over eggplant mixture. Cover with lid or foil and bake until eggplant is tender and mixture bubbles, about 30 minutes. Remove lid or foil and bake an additional 7 to 10 minutes until browned. Serves 8. Thank you for sharing this recipe! It sounds really tasty! I can’t wait to try this! Just my kind of thing. Thank you. So sorry you lost most of your Sphere magazines in the flood. This recipe sounds yummy. Can’t wait to try it. That Blackhawk Salad recipe sounds intriguing!! Let us know if it is good. I have always wanted to make that Blackhawk Salad but it makes a lot and is very long. I’ll wait for a time when we have company – maybe when the Finns come next summer!